As I'm sure most couples do, Dave and I have been trying to lose a few pounds before we tie the knot. However, since we have a long engagement, we are able to do it in a healthy way, by making lifestyle changes instead of crash dieting. So far he is down 30 pounds (!!!) and I am down about 13. Being healthy over the holidays is hard. There really isn't any other way to describe it. Especially over Thanksgiving, where it seems like the whole point is to indulge. This year we are hosting Dave's mom and one of our friends from the area. This will give us more room to control the menu and create healthy (but still delicious) recipes to share for our Thanksgiving dinner. When we were planning our menu, we first brainstormed all the things that we knew made a Thanksgiving dinner traditional. Our kitchen and appliances are small, so we knew that we'd need our friend Andrew's help in cooking some of the dishes. Things on our list included turkey, candied yams, mashed potatoes, salad, corn, pumpkin pie, cranberry sauce, gravy, stuffing, and biscuits. Now, since we only have four people eating we can cut down on some of these things. For example we don't need to have yams and potatoes. Also, instead of a pie, I am going to make individual servings of pie "parfait." I have to figure out how I'm going to do this, but I'm sure I'll post about it after the fact!! For the other recipes that are traditional to Thanksgiving dinner, I found some recipes that cut down sugar, carbs and other bad things. I want to do a test run on them before we eat dinner next Thursday, but honestly, we have had such good luck with healthy recipes in the 4-5 months that we've changed our diet, that I almost want to just go all in! Below is a list of some healthy holiday recipes that we will probably be using. I hope this helps! You can definitely still enjoy the holiday, without ruining your diet. Let me know if you try any of these recipes. I'd love to know what you think! Linking up with The Grits Blog and Treasure Tromp! The recipes are totally do-able. 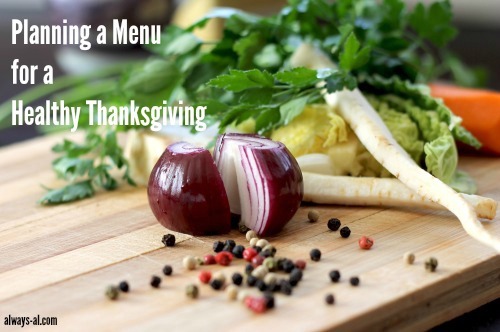 Great menu we have to have mashed potatoes at all holidays in my home. Thanksgiving and Christmas are difficult times to keep to a diet, I agree! I do my best to keep meals healthy but it's hard when we all have a sweet tooth! Love this! We've been attempting to eat better, but I'm nervous about all the delicious food next week! Can't wait to try some of these! These are some great options! There are ways to make just about everything healthier. I love having the option.